Spring is here! 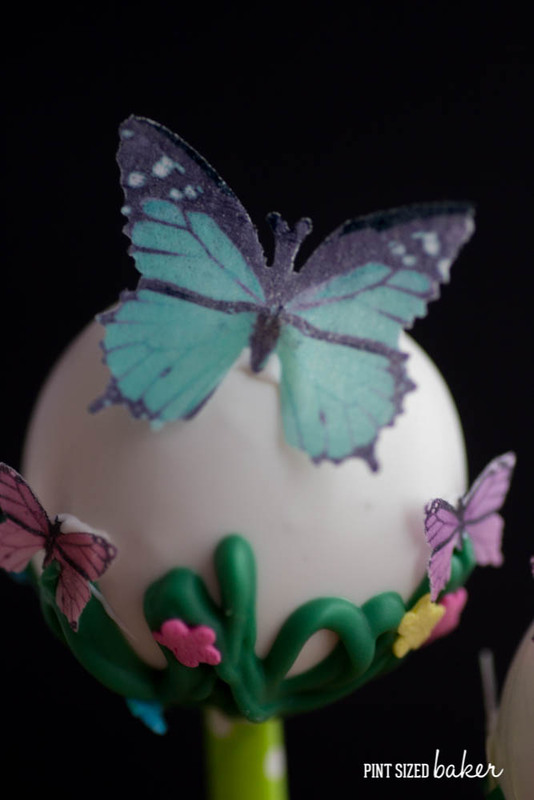 Making these Wafer Paper Butterfly Cake Pops are so easy! 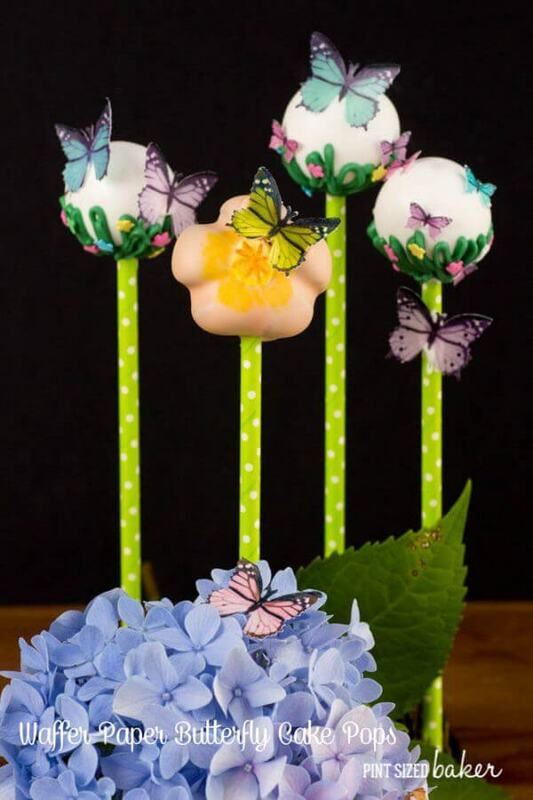 Order your mini butterflies and then decorate some simple flower cake pops. 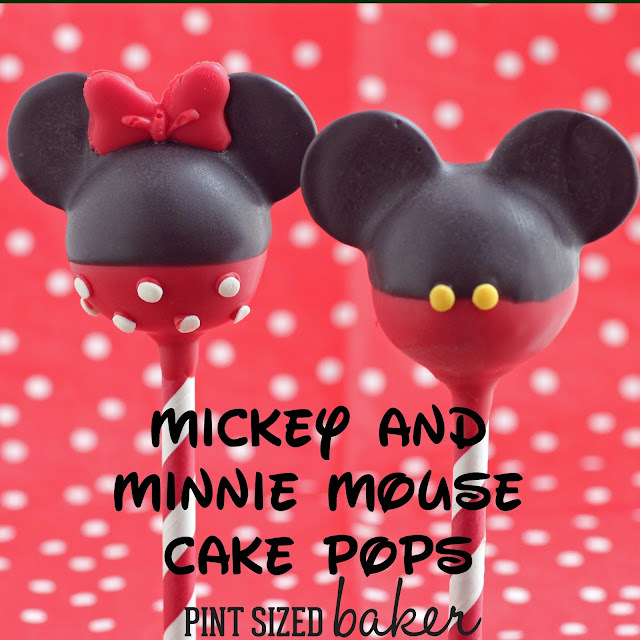 It’s been a while, but I finally made some cake pops. 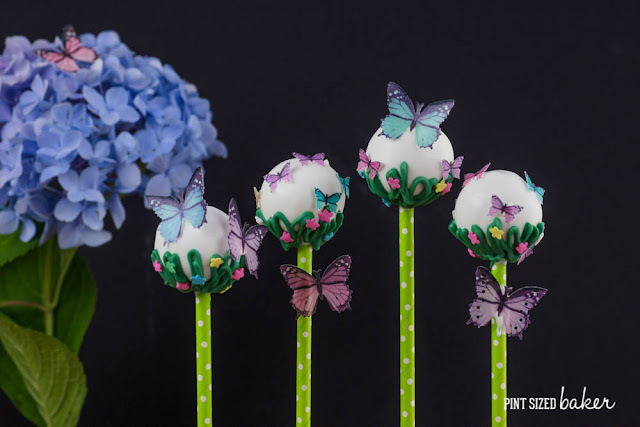 My kid has been asking me about making her some for a few weeks now, so I finally, finally made these beautiful wafer paper butterfly cake pops for her and she loved them! Aren’t they just so perfect? The lovely Pege from Never Forgotten Designs, sent them to me to test out and photograph. 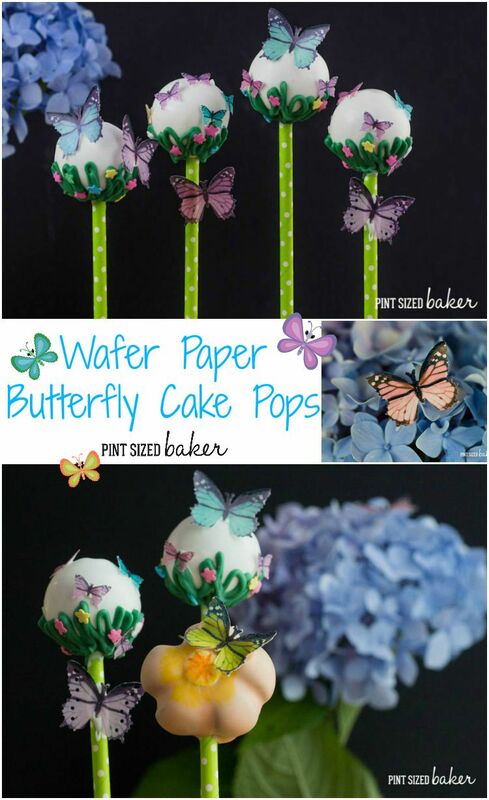 These pops would be blah without these pretty, pre-cut rice wafer butterflies. I (big puffy heart) love them! These butterflies are made from rice paper and are totally edible. My daughter ate them, but didn’t have much to report on a taste. There just really wasn’t one there. I thought they would be really delicate, but they held up better then I expected. No ripping or tearing when I handled them, so I was really pleased with their durability. Pege sent me some of the large butterflies and the miniature butterflies. I really liked the combination of the sizes because they added a lot of options to decorate with. Once the pops were decorated and dry, I just added a drop of went candy to the pop and attached the butterfly. These pops really couldn’t be easier. Roll round cake balls and melt your candy melts. 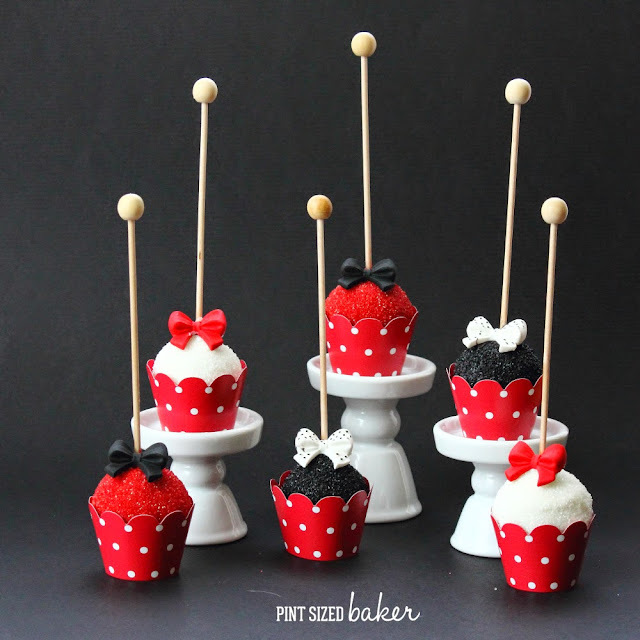 Use fun straws or lollipop sticks and flower sprinkles to add some whimsical flair. Melt some green candy melts. 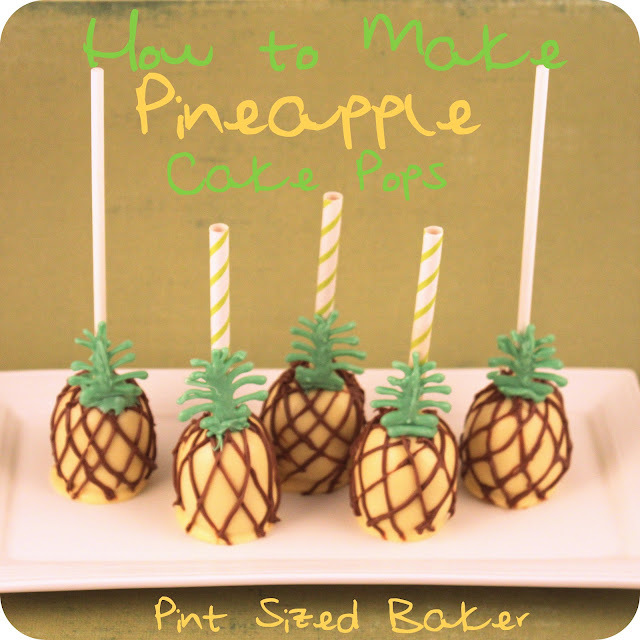 Pour the melted candy into a baggie or use a parchment cone and pipe some grass on the lower half around the stick on. While wet, add the flower sprinkles and stand to dry. Complete all the cake pops. 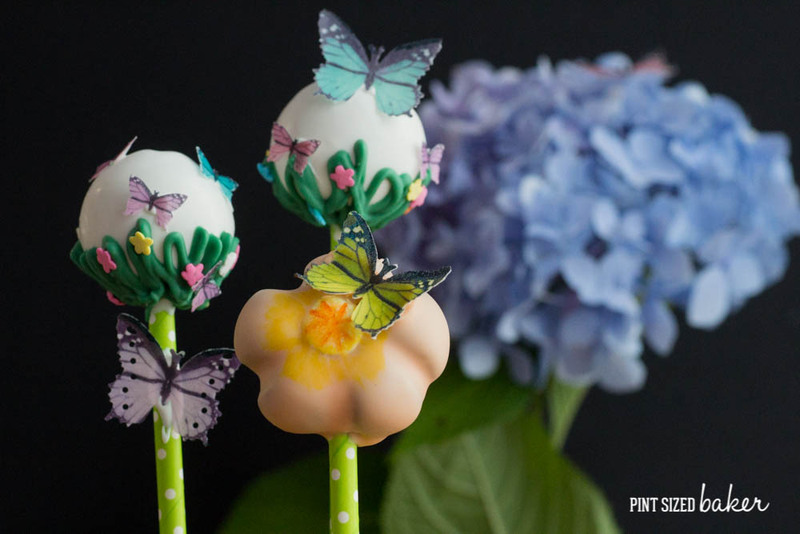 Use a toothpick to add a drop of wet candy to the pop and attach the butterflies. You can fold the wings back or leave them flat like I did. I made one flower by using a lollipop stick to create the petals then I dipped and decorated with edible markers and a butterfly. See? It couldn’t be easier and the they would be perfect for a birthday part, garden tea party, or even a wedding. Thanks to Never Forgotten Designs for sending me the butterflies! You can order more wafer paper decals from her on her website, and follow here on Facebook and Instagram for more lovely ideas and personalized creations! I’ll have another tutorial next week with some fun isomalt decorations she sent as well!